The IT Associate is responsible for installing, maintaining and configuring hardware and software systems for the company. 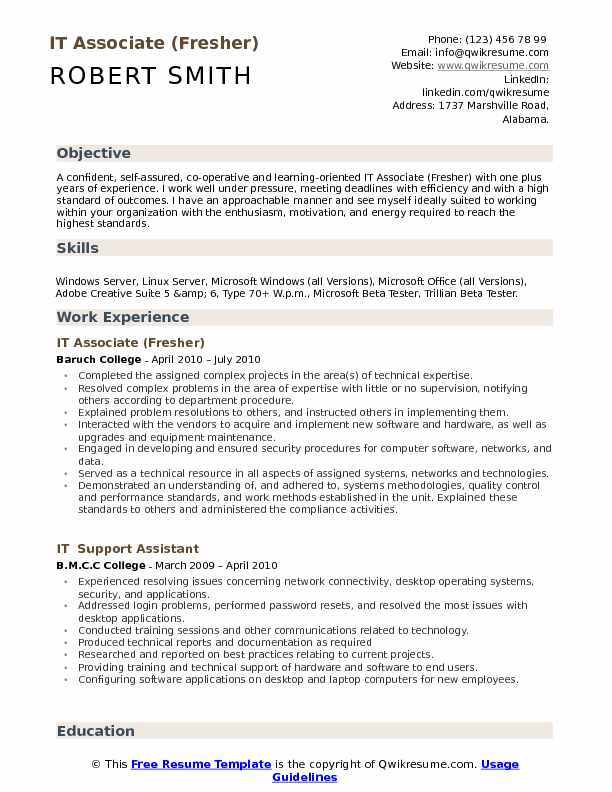 A well-crafted IT Associate Resume emphasizes the following core tasks such as – troubleshooting and repairing network issues, performing routine maintenance work, testing network and server systems, performing hardware and software upgrades, performing root cause analysis, maintaining IT Structure, managing help disk issues, performing system back-up, upgrading periodically software antivirus, and providing related technical support. 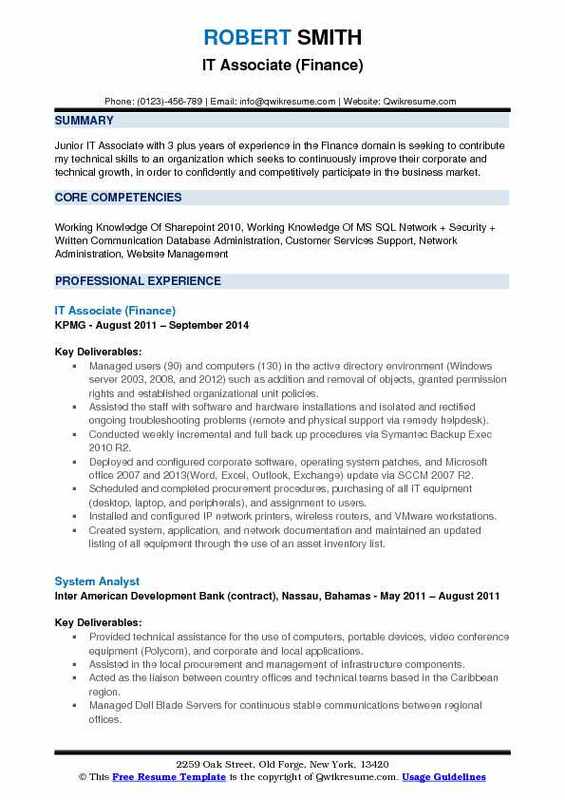 Summary of skills expected from an IT Associate includes – the ability to research, analyze and troubleshoot complex issues; thorough knowledge of email and VOIP technologies, outstanding knowledge of Windows, Mac, and Linux platforms, exceptional technical skills and comprehensive knowledge of various hardware and software products. A bachelor’s degree in Computer Science or Engineering along with relevant work experience is commonplace among most of the IT Associates. Objective : A confident, self-assured, co-operative and learning-oriented IT Associate (Fresher) with one plus years of experience. I work well under pressure, meeting deadlines with efficiency and with a high standard of outcomes. I have an approachable manner and see myself ideally suited to working within your organization with the enthusiasm, motivation, and energy required to reach the highest standards. Skills : Windows Server, Linux Server, Microsoft Windows (all Versions), Microsoft Office (all Versions), Adobe Creative Suite 5 & 6, Type 70+ W.p.m., Microsoft Beta Tester, Trillian Beta Tester. Completed the assigned complex projects in the area(s) of technical expertise. Resolved complex problems in the area of expertise with little or no supervision, notifying others according to department procedure. Explained problem resolutions to others, and instructed others in implementing them. Interacted with the vendors to acquire and implement new software and hardware, as well as upgrades and equipment maintenance. Engaged in developing and ensured security procedures for computer software, networks, and data. Served as a technical resource in all aspects of assigned systems, networks and technologies. Demonstrated an understanding of, and adhered to, systems methodologies, quality control and performance standards, and work methods established in the unit. Explained these standards to others and administered the compliance activities. Prepared proposals and substantive written reports of a complex nature; made formal presentations of findings. Participated in the administrative task forces and served as a project leader. 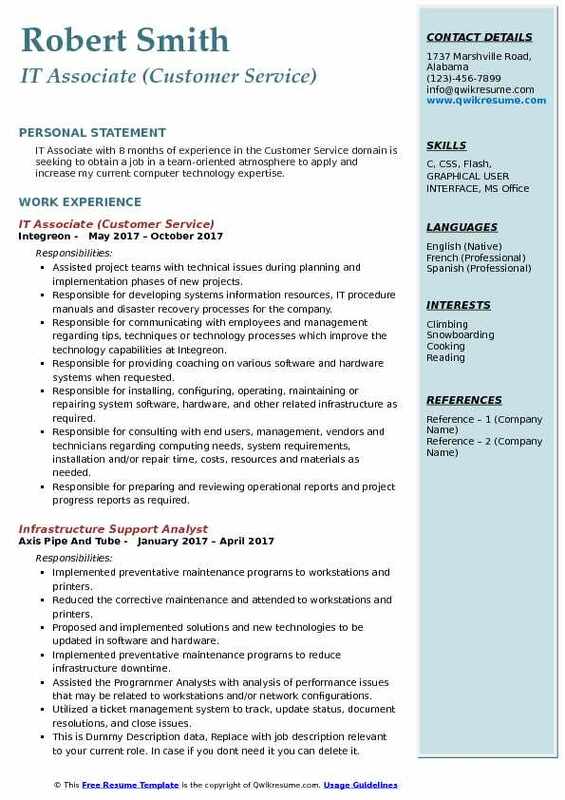 Objective : Junior IT Associate with 3 plus years of experience in the Finance domain is seeking to contribute my technical skills to an organization which seeks to continuously improve their corporate and technical growth, in order to confidently and competitively participate in the business market. Managed users (90) and computers (130) in the active directory environment (Windows server 2003, 2008, and 2012) such as addition and removal of objects, granted permission rights and established organizational unit policies. Assisted the staff with software and hardware installations and isolated and rectified ongoing troubleshooting problems (remote and physical support via remedy helpdesk). Conducted weekly incremental and full back up procedures via Symantec Backup Exec 2010 R2. Deployed and configured corporate software, operating system patches, and Microsoft office 2007 and 2013(Word, Excel, Outlook, Exchange) update via SCCM 2007 R2. Scheduled and completed procurement procedures, purchasing of all IT equipment (desktop, laptop, and peripherals), and assignment to users. Installed and configured IP network printers, wireless routers, and VMware workstations. Created system, application, and network documentation and maintained an updated listing of all equipment through the use of an asset inventory list. Migrated staff settings and files from Windows XP and Vista to Windows 7 via Windows easy transfer tool. Liaised and collaborated with global technical teams for ongoing update and maintenance of kpmg proprietary programs. 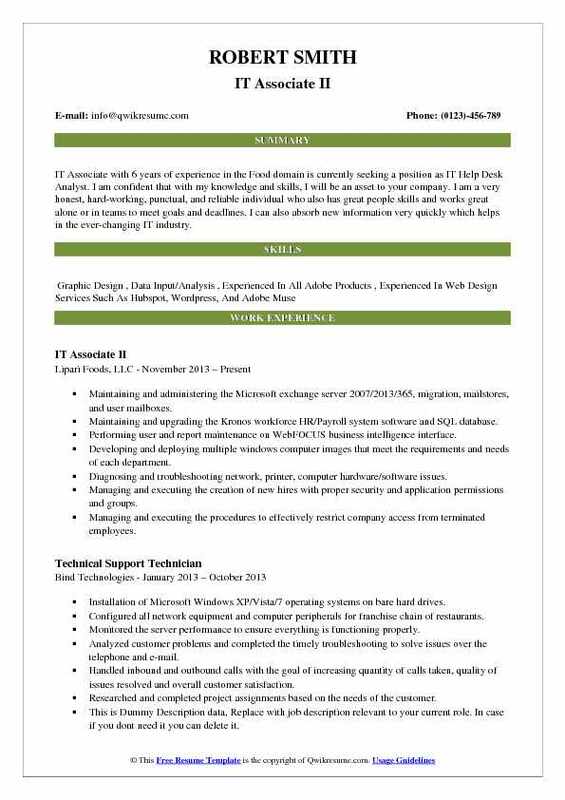 Headline : IT Associate with 6 years of experience in the Food domain is currently seeking a position as IT Help Desk Analyst. I am confident that with my knowledge and skills, I will be an asset to your company. I am a very honest, hard-working, punctual, and reliable individual who also has great people skills and works great alone or in teams to meet goals and deadlines. I can also absorb new information very quickly which helps in the ever-changing IT industry. Maintaining and administering the Microsoft exchange server 2007/2013/365, migration, mailstores, and user mailboxes. Maintaining and upgrading the Kronos workforce HR/Payroll system software and SQL database. Performing user and report maintenance on WebFOCUS business intelligence interface. Developing and deploying multiple windows computer images that meet the requirements and needs of each department. Diagnosing and troubleshooting network, printer, computer hardware/software issues. Managing and executing the creation of new hires with proper security and application permissions and groups. Managing and executing the procedures to effectively restrict company access from terminated employees. Monitoring the server performance to ensure everything is functioning properly. Setup windows deployment tools to allow all our workstations to receive important updates. Creating group policies for mapping drives, printers, windows updates, anti-virus deployment, software upgrades, internet. Provided support for a division of software or hardware issues, which included assisted faculty, student, and staff with the setup of their campus computers network, and set up monitors, printers, and other external devices and troubleshooting. Created, maintained, and removed division accounts and organized users, groups, and locations for security and user convenience. Consulted and informed on issues of replacing backup services and fixing. Providing in-depth support for windows applications, network connectivity and accounts, network printing, and any other hardware/software issues. Deploy computers for replacement or repair of existing equipment and new hires. Completes end to end desktop activities for installs, moves, adds, changes, updates and projects. Assisted with installing, and troubleshooting issues with, network, computer, hardware, and printers throughout the company. 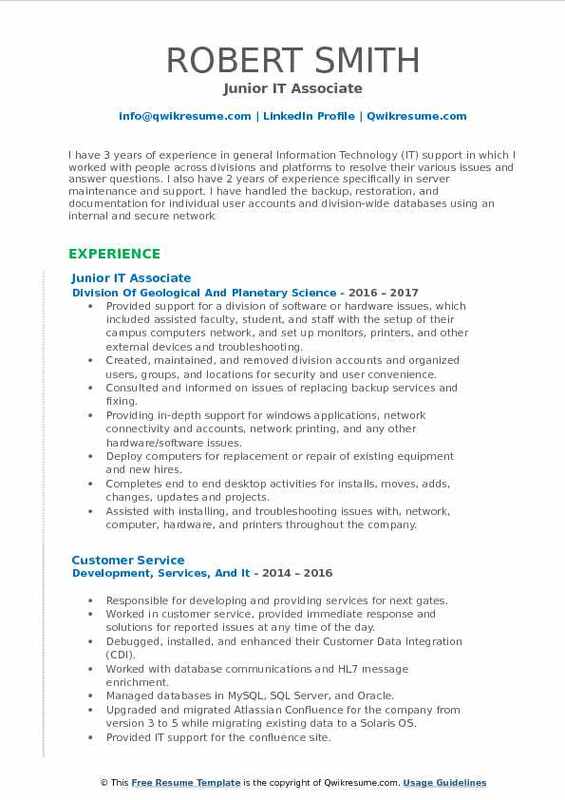 Objective : IT Associate with 8 months of experience in the Customer Service domain is seeking to obtain a job in a team-oriented atmosphere to apply and increase my current computer technology expertise. Assisted project teams with technical issues during planning and implementation phases of new projects. Responsible for developing systems information resources, IT procedure manuals and disaster recovery processes for the company. Responsible for communicating with employees and management regarding tips, techniques or technology processes which improve the technology capabilities at Integreon. Responsible for providing coaching on various software and hardware systems when requested. Responsible for installing, configuring, operating, maintaining or repairing system software, hardware, and other related infrastructure as required. Responsible for consulting with end users, management, vendors and technicians regarding computing needs, system requirements, installation and/or repair time, costs, resources and materials as needed. Responsible for preparing and reviewing operational reports and project progress reports as required. Responsible for staying current with advances in technology, new software applications, and new hardware in order to make recommendations for improvements in Integreon technology systems. Responsible for meeting quality and process standards and expectations as defined by the organization and particular to each work activity. Responsible for continuing education to maintain and enhance relevant work skills by participating in a company-sponsored training and development programs as business needs arise. Maintained and supported the ISO standards through creation and updating of documentation and compliance with all security standards. Headline : A logical and self-motivated IT Associate with 6 plus years of experience in the Legal Services domain is willing to take on new challenges, with a goal to advance career within the IT sector. 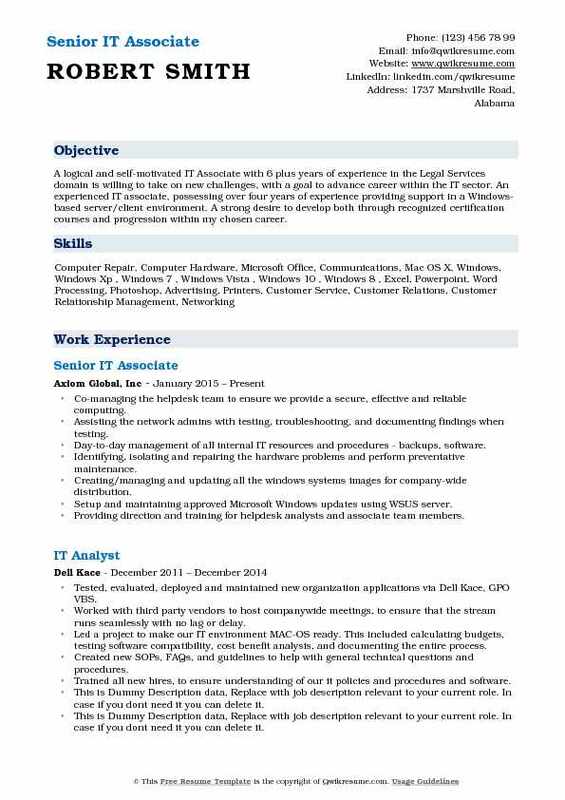 An experienced IT associate, possessing over four years of experience providing support in a Windows-based server/client environment. A strong desire to develop both through recognized certification courses and progression within my chosen career. Co-managing the helpdesk team to ensure we provide a secure, effective and reliable computing. Assisting the network admins with testing, troubleshooting, and documenting findings when testing. Day-to-day management of all internal IT resources and procedures - backups, software. Identifying, isolating and repairing the hardware problems and perform preventative maintenance. Creating/managing and updating all the windows systems images for company-wide distribution. Setup and maintaining approved Microsoft Windows updates using WSUS server. Providing direction and training for helpdesk analysts and associate team members. Managing the project to replace all laptops out of warranty and ensure minimal end-users. Managing the project to move previous online backup solution to current one, saving the company. 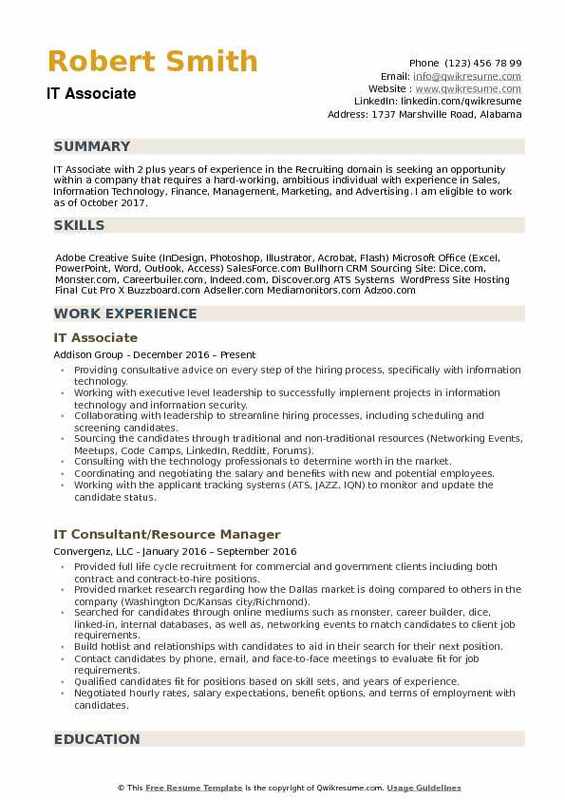 Objective : IT Associate with 1 plus years experience in the Non-Profit domain is seeking to obtain a job in a team-oriented atmosphere to apply and increase my current computer technology expertise. Monitoring service desk tickets and taking assignments to resolving end-user computing issues. Ensuring implementation of resolutions in a timely and effective manner. Providing apartment development property support – including connectivity troubleshooting for wired and wireless networks, computer, peripheral, and mobile device support. Diagnosing the end-user system failures and resolve issues in a timely and efficient manner. Diagnosing printer and other peripheral device failures and resolving issues. Completing other related tasks assigned by the Manager of Information Technology and Vice President of Information Technology. Developing knowledge base articles and documentation for information technology standardization and procedures. Providing training for end users to utilize technology and enhance the performance. Working with the 3rd party vendors such as TPX, Mindshift, NBM, and ISERV to support Polycom phone infrastructure, exchange administration, printer support, and network support. 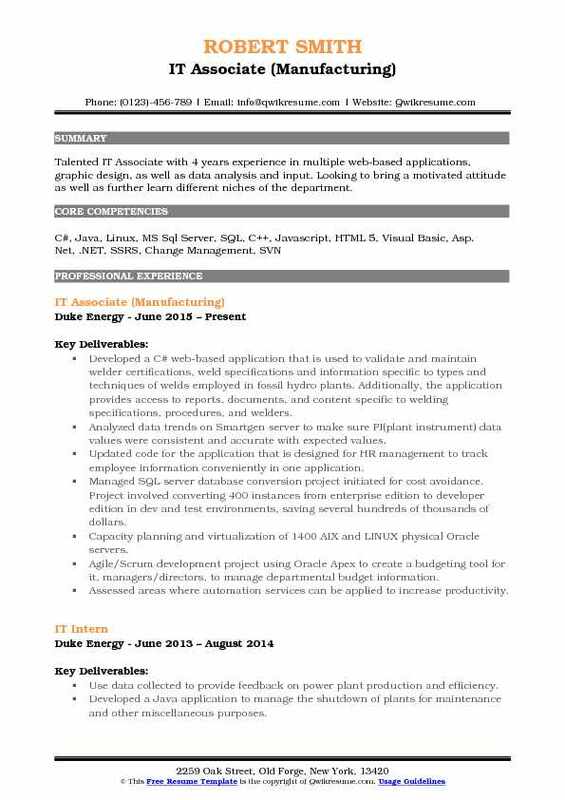 Objective : Talented IT Associate with 4 years experience in multiple web-based applications, graphic design, as well as data analysis and input. Looking to bring a motivated attitude as well as further learn different niches of the department. Developed a C# web-based application that is used to validate and maintain welder certifications, weld specifications and information specific to types and techniques of welds employed in fossil hydro plants. Additionally, the application provides access to reports, documents, and content specific to welding specifications, procedures, and welders. Analyzed data trends on Smartgen server to make sure PI(plant instrument) data values were consistent and accurate with expected values. Updated code for the application that is designed for HR management to track employee information conveniently in one application. Managed SQL server database conversion project initiated for cost avoidance. Project involved converting 400 instances from enterprise edition to developer edition in dev and test environments, saving several hundreds of thousands of dollars. Capacity planning and virtualization of 1400 AIX and LINUX physical Oracle servers. Agile/Scrum development project using Oracle Apex to create a budgeting tool for it, managers/directors, to manage departmental budget information. Assessed areas where automation services can be applied to increase productivity. Created various test cases to simulate the stress environments of proposed it systems, decreasing the time of dev/test cycles, improving quality, and reducing infrastructure spend. Installation of devops software on Linux servers(GIT, Java, Maven, OpenJDK) and building Jenkins jobs. 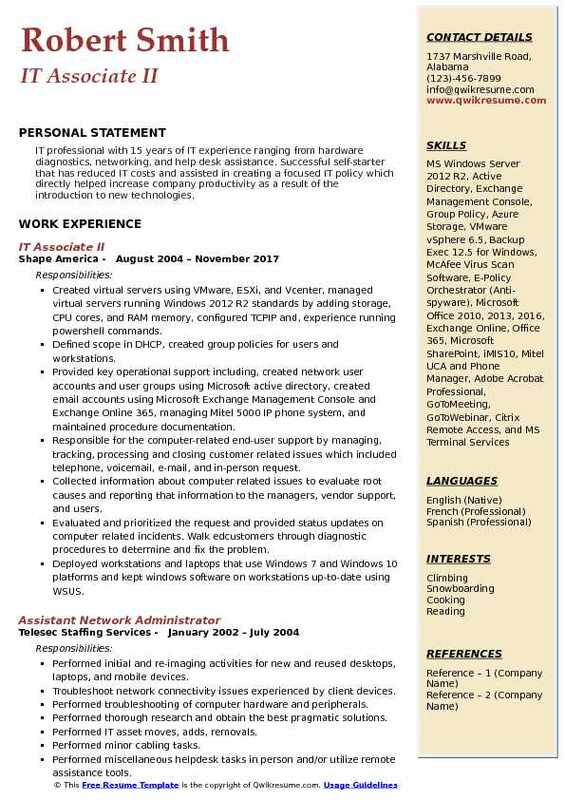 Summary : IT professional with 15 years of IT experience ranging from hardware diagnostics, networking, and help desk assistance. Successful self-starter that has reduced IT costs and assisted in creating a focused IT policy which directly helped increase company productivity as a result of the introduction to new technologies. Created virtual servers using VMware, ESXi, and Vcenter, managed virtual servers running Windows 2012 R2 standards by adding storage, CPU cores, and RAM memory, configured TCPIP and, experience running powershell commands. Defined scope in DHCP, created group policies for users and workstations. Provided key operational support including, created network user accounts and user groups using Microsoft active directory, created email accounts using Microsoft Exchange Management Console and Exchange Online 365, managing Mitel 5000 IP phone system, and maintained procedure documentation. Responsible for the computer-related end-user support by managing, tracking, processing and closing customer related issues which included telephone, voicemail, e-mail, and in-person request. Collected information about computer related issues to evaluate root causes and reporting that information to the managers, vendor support, and users. Evaluated and prioritized the request and provided status updates on computer related incidents. Walk edcustomers through diagnostic procedures to determine and fix the problem. Deployed workstations and laptops that use Windows 7 and Windows 10 platforms and kept windows software on workstations up-to-date using WSUS. Troubleshoot problems for operating systems, application software, LAN, and mobile devices. Able to notify incident stakeholders on system outages in a professional manner. 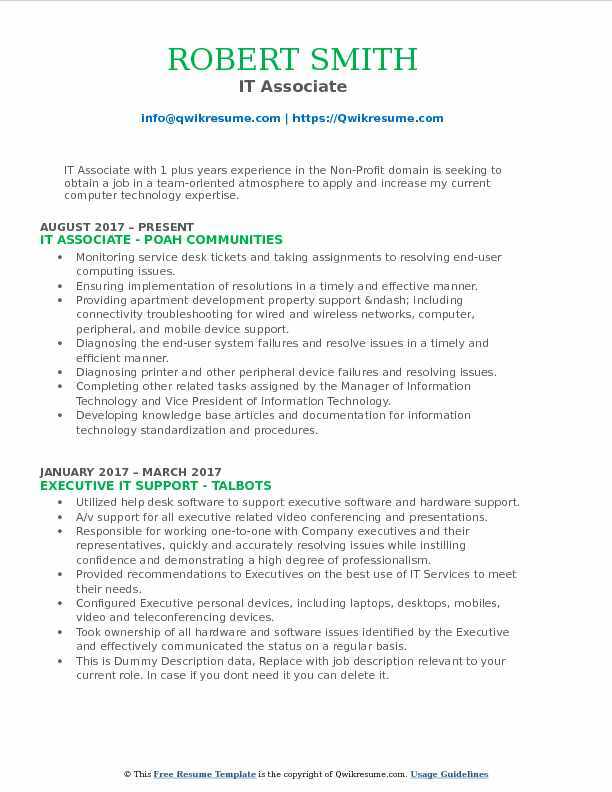 Objective : IT Associate with 2 plus years of experience in the Recruiting domain is seeking an opportunity within a company that requires a hard-working, ambitious individual with experience in Sales, Information Technology, Finance, Management, Marketing, and Advertising. I am eligible to work as of October 2017. Providing consultative advice on every step of the hiring process, specifically with information technology. Working with executive level leadership to successfully implement projects in information technology and information security. Collaborating with leadership to streamline hiring processes, including scheduling and screening candidates. Sourcing the candidates through traditional and non-traditional resources (Networking Events, Meetups, Code Camps, LinkedIn, Redditt, Forums). Consulting with the technology professionals to determine worth in the market. Coordinating and negotiating the salary and benefits with new and potential employees. Working with the applicant tracking systems (ATS, JAZZ, IQN) to monitor and update the candidate status. Sourcing for candidates in multiple sectors including; infrastructure/database- network engineers, network administrators, noc managers, field engineers, system engineers, system administrators, project managers, help desk and desktop support specialists, security engineers, storage engineers. Bmfa - business analysts, underwriters, project specialists, and QA analysts. Web - Java developers, full-stack engineers, solutions engineers, software architects.